1. 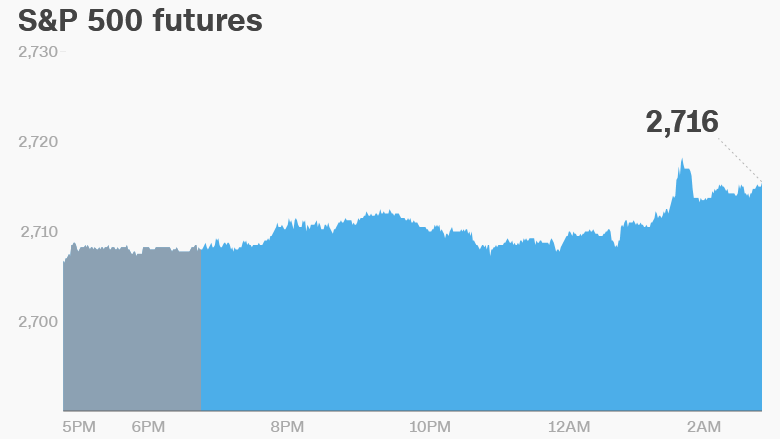 Trump's trade bet: Markets took a hit on Thursday after the Trump administration opened a second front in its global trade war. The US announced steep tariffs on steel and aluminum imports from three of America's biggest trading partners — Canada, Mexico and the European Union. The move came just two days after the White House said it was moving forward with tariffs on $50 billion worth of Chinese goods as punishment for intellectual property theft. The European Union, Canada and Mexico have said they will respond with punitive measures targeting American products worth billions of dollars. China has also threatened trade retaliation. 2. Jobs report: The US unemployment rate dropped to 3.8% in May, matching its lowest point since 1969, according to a report released by the US Labor Department. The economy added 223,000 jobs in May, more than the 188,000 expected by economists. The economy has added jobs every month for seven and a half years, the longest streak on record. 3. More trouble for Deutsche Bank: S&P Global Ratings has slashed Deutsche Bank's credit rating, citing "significant execution risks" in its overhaul strategy. The downgrade comes one day after news broke that the Federal Reserve had labeled the bank's US business "troubled." The secret designation from the Fed took place about a year ago and forced Deutsche Bank (DB) to dial back its risk taking, The Wall Street Journal reported. In response, Deutsche said it is "very well capitalized and has significant liquidity reserves." Shares in Deutsche fell sharply after the Journal's report was published on Thursday. But they rebounded on Friday, gaining 2.3% in morning trade. Christian Sewing, who was named CEO in April, addressed the run of negative news in a message sent to employees. "Many of you are sick and tired of bad news. That's exactly how I feel," he said. "But there's no reason for us to be discouraged." 4. Sigh of relief in Italy: Italy's main stock market was 2.8% higher on Friday, and government bonds rallied. Investor fears of a major political crisis in eurozone's third biggest economy subsided with populist parties inching closer to forming a government headed by Giuseppe Conte, a law professor and political novice. "While euroskeptics will still dominate ... markets were considering this a preferable outcome to the alternative of fresh elections," said Artjom Hatsaturjants, an analyst at Accendo Markets. 5. Global market overview: US stock futures were pointing higher. European markets opened higher, while stocks in Asia closed mixed. The Dow Jones industrial average shed 1% on Thursday, while the S&P 500 dropped 0.7% and the Nasdaq declined 0.3%. Still, the indexes notched their best month since January in May. 6. Companies and economics: Abercrombie & Fitch (ANF) and Big Lots (BIG) will release earnings before the open. Australian authorities announced criminal charges against Citigroup (C), Deutsche Bank and Australian Bank ANZ over a placement of ANZ shares in 2015.